"An indecisive couple struggles on their plans for New Years Eve and a simple question spirals into a fear driven examination of their long winded, broken relationship"
Routine is their maker but longtime couple Phoebe and Ben seem “content”. It’s the underlying feelings hidden from point blank that finally bubble up to the surface during a simple morning breakfast. Over time their insecurities finally push each person to their limit and this is the story of that exact moment. Crossing a line that they has never been explored, all witnessed from the mind of Phoebe’s imagination. At its core, Champagne Social is a drama through a hyperactive lense. The ebbs and flows of a real relationship told through a heightened awareness of a character’s inherit insecurities and eventual self sabotage. The short film is a surreal dive into the mental pitfalls of long term relationships. “Champagne Social” is not a romantic film. The characters in the story offer an honest and intimate look into looming shadow that drapes over many relationships: The Fear of Losing Each Other. 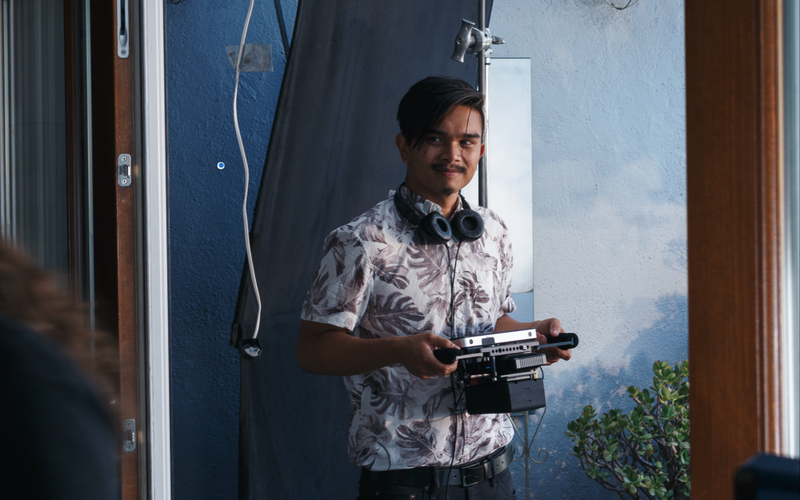 With roots in the Bay Area, Santa Barbara, Los Angeles and even Germany; Filipino-American filmmaker Ralph Torrefranca has a unique upbringing under his belt. Most known for his work as the frontman/guitarist of the band Dr. Doctor (Spotify Fresh Finds, KROQ, KCRW), the artform of great storytelling has been an obsession for Ralph. Over the summer of his Sophomore year of Highschool, an intro to film class taught by Santa Barbara International Film Festival founder Roger Durling left a long lasting impression on 15 year old Ralph and subsequently his ongoing love for cinema. Armed with a Mini DV Sony Handycam, he went spent his early years filming DIY music videos and short films with his friends in Santa Barbara, CA. Flash forward to his current years in Los Angeles, Ralph has garnered a few projects on his CV including “Bellingham” (2012) a short film he wrote and co-produced that was directed by Ron Santarsiero. He has also produced/co-wrote music videos for bands like Torches (When You Gonna). In addition to his production work, Ralph’s main focus has been in screenwriting and directing. “Champagne Social” is a culmination of years thru personal experience, studying both loving but ultimately toxic relationships either first hand or by close friends. The original script for Champagne Social was born out of an emotional exercise; an honest journal entry to work thru toxicity in a close relationship. These connections with each other in relationships (be it family, platonic or romantic) are both tangible but at the same time the absolute most complex algorithms that none of us can really figure out. They are misunderstood and subjective, which is why Champagne Social is both a realistic intimate interpretation in it’s raw emotion but at the same time, told thru a heightened perspective on film. I think the story is brazenly honest and delivers a real gut punch to the audience. Skyler Bible as "Ben" and Lindsay Naves as "Phoebe"
Background: Shane Carpenter, Paul Gutierrez, Freddy Hernandez, Makenna Cortney, Austin Slaughter, Amber Ruthe.